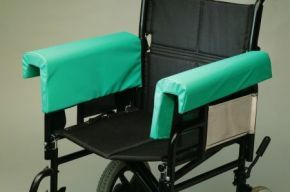 These simple but effective wheelchair arm covers fit snugly to the chair and give the wheelchair user more comfort. They are easy to attach with hook and loop fastenings and take up little space within the chair. Size 460mm x 70mm x 100mm (18” x 2¾” x 4").